Miss Oddette Howard knows barbecue she learned the secrets of sauce and smoke in her grandmother's own Creole kitchen. From humble roots comes Miss Oddette's "No Joke" and "Special Report" barbecue sauces. SPICE FOR LIFE : Miss Odette makes hot sauce to complement burgers, ribs, chops, steaks, poultry, and just about anything you can dream up. One fan of the sauce even claims that it goes well on corn flakes. # balance of sweet and tangy flavors with a healthy kick. The heat comes from a mix of cayenne and habanero peppers heavier in the "No Joke," and with a little less spice, but more sweet, in the "Special Report." These savory sauces aren't all bite and no bark. "It's not that kind of heat that hurts it's got to have flavor!" Miss Oddette insisted. "I don't like that hot for hot's sake." For the last three years, Miss Oddette has catered to the public with her own brand of Southern-style smoked meats laced with a "California twist." Deep South ribs with her patented sauce, dry-rubbed pork, California white-wine chicken, and tri-tip with red wine grace her smoker. Everything is slow cooked, and never touched with direct heat. After a successful year of catering and at the urging of her friends Miss Oddette decided to take her hot sauce to the people. She recruited her husband, her children, and even her children's friends to help make and package the sauce. When it came time to sell it, Miss Oddette took one case to the market and hoped for the best. She sold out in an hour. The next week, she brought three cases and sold out in no time. Even with an amazing recipe and support from friends and family, no one could have guessed how successful the barbecue sauces could be. Her big break came when she won Save Mart's barbecue-sauce contest. Officials from the store were so impressed, they decided to carry her sauce in 80 California locations. Miss Oddette is still a newcomer in the hot-sauce world, but you can find her product in about 150 grocery stores and specialty shops around California. A jar of home-style barbecue sauce will cost you about $5 in grocery stores. 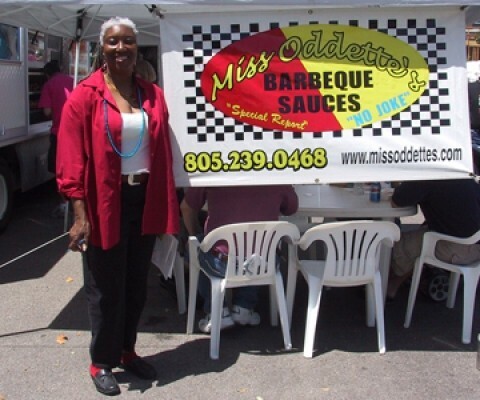 If you're dying try some of Miss O's famous barbecue, you can get a taste at the Mid-State Cruizers Car Show in Atascadero on Aug. 19, or at the Paso Robles Olive Festival on Aug. 26. For catering and product information, call 610-3778 or 544-0134. New Times contributor Kylie Mendonca compiled this week's Strokes and Plugs. Send your business news to kvelie@newtimesslo.com.